Glenogra is a beautifully appointed Georgian residence in an excellent location, close to the city centre, DART and all amenities. The house has been furnished to a high standard of comfort in pleasing fabrics and colours. 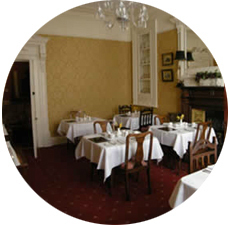 Glenogra is a beautiful guesthouse situated in the heart of Ballsbridge just ten minutes from Dublin City Centre. Opposite the R.D.S. and the new Four Seasons Hotel we are close to all amenities including Sandymount DART station, major bus routes, the Air Coach and car ferries. Within a few minutes walk there are a range of excellent restaurants and traditional bars. 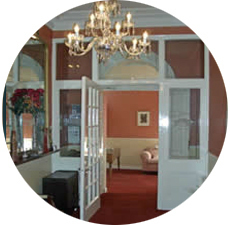 We were awarded Four-Star accommodation by Bord Failte and the Five Diamonds from the RAC and AA. In 1993 we were awarded the "The best new guest house" by the AA and in 2000 the RAC awarded us the Sparkling Diamond for our "Warm Welcome". Glenogra is a non-smoking guest house managed by Seamus & Cherry Mc Namee for the past 10 years. Our high standards, dedication to excellence and service to our guests makes Glenogra stand out as one of Dublins leading guest houses. We have been recommended by "Signpost U.K.", "Georgina Campbell" and "Dillard & Causin" as one of Dublins leading accommodations. Passing Trinity College on your left, continue onto Nassau Street, Merrion Square, straight onto Mount St, then passing the Old School House Hotel on your left, onto Northumberland Road, then passing Jurys Hotel on your left. Glenogra is a further 800 metres from Jurys on your left opposite the Four Seasons Hotel. More detailed directions from airport, west and south available on request. 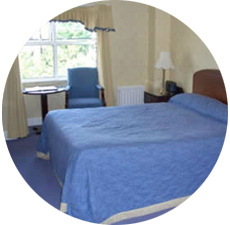 Glenogra is a family run guest house with twelve beautifully appointed bedrooms. All our rooms are en suite and non smoking. Every room is provided with hairdryers, colour television, tea and coffee facilities. A full Irish Breakfast is served every morning in our dining room. Parking facilities are provided for our guests.